Located in a peaceful bush setting, near the crystal clear waters and white sand beaches of Jervis Bay, this is luxe camping at its finest. 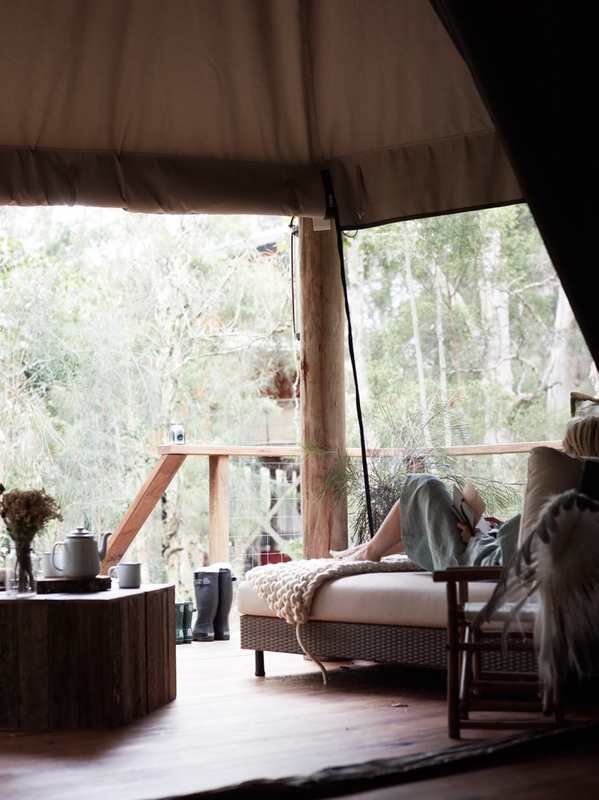 One of the pioneers of luxury camping in Australia, Paperbark Camp was around before the term 'glamping' was even invented! Paperbark Camp offers a unique blend of stylishly fitted out safari tents and gourmet food and wine in The Gunyah restaurant. With the option to explore and be active on the provided bikes and kayaks, or to simply relax and enjoy your beautiful surroundings, Paperbark Camp offers something for everyone. 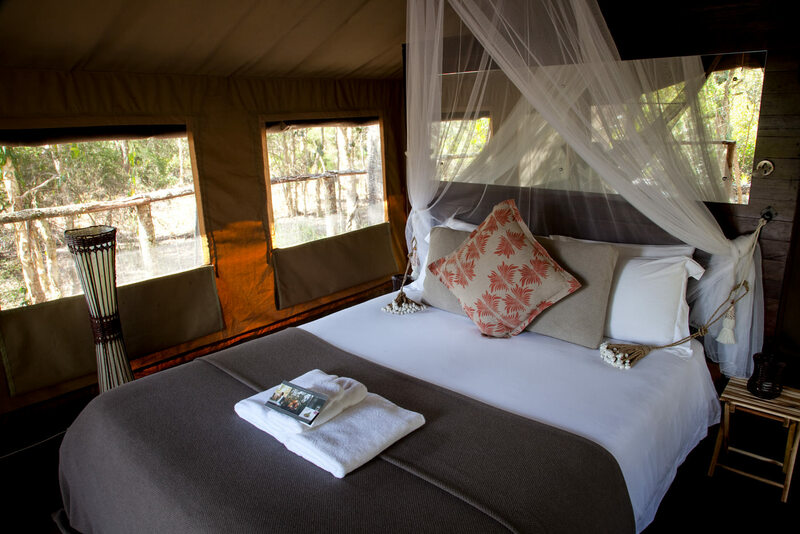 Accommodation consists of 12 safari style tents, raised off the ground and situated amongst the soaring eucalypts and paperbarks. 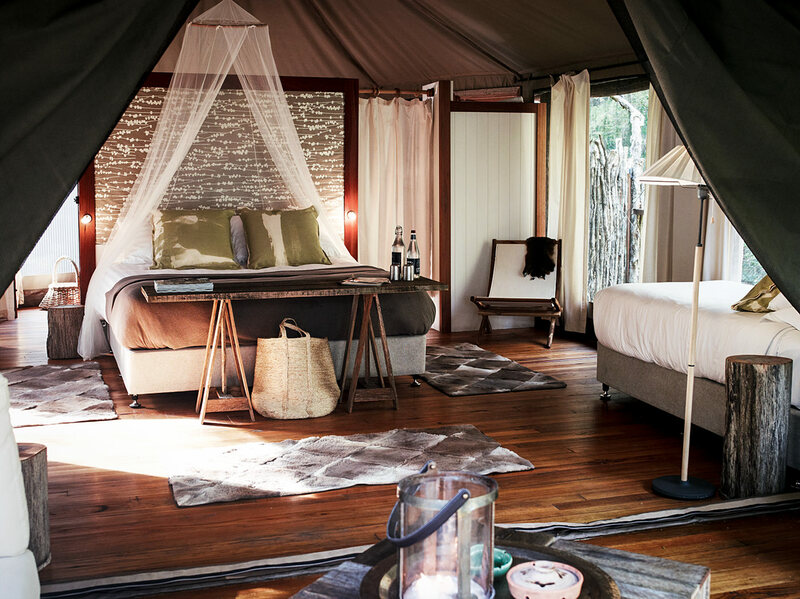 All tents feature polished hardwood floors, solar powered lighting, full insect screening, high quality linen and wrap around decking with outdoor furniture. To complete the luxe camping experience, enjoy a steaming hot shower in your private open air ensuite, complete with hand crafted soaps and lotions and fluffy bath robes. 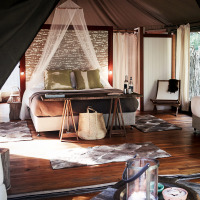 Deluxe and King Deluxe tents feature contemporary furnishings and free-standing bath. Paperbark Camp has achieved Advanced Eco Accreditation and, as such, you will not find air-conditioning or heating, TV, mini bar or power points, though power and wifi can be accessed in The Gunyah. This all provides the perfect opportunity to tune in to your surroundings and truly unwind. Bikes and canoes are provided for guests to use on a complimentary basis. A 15 minute ride will take you to the bayside town of Huskisson. Or take the Paperbark Challenge and canoe to Huskisson, stopping for a picnic on the banks of the Currambene Creek. There are also some easy walking trails, meandering through paperbark, gum and mangrove forests, where you may spot some local wildlife such as kangaroos. Nearby excursions, as included in the South Coast Extreme Explorer Package, include a dolphin cruise and Illawarra Fly treetop walk. The Gunyah Restaurant offers a fine dining experience among the treetops in a unique architect designed space. In the warmer weather, three-course meals can be enjoyed by candlelight on the verandah while you observe the colourful birdlife, resident possums and sugargliders. In the cooler months, curl up on the lounge by the open fire after dinner with a nightcap. The Sundowner Deck also offers the perfect place to enjoy an afternoon drink and tasty bar snacks while watching the changing light of the bush. 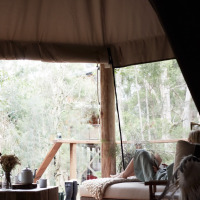 Paperbark Camp operates from the beginning of September until the June long weekend (1st weekend in June). Jervis Bay offers a mild maritime climate with average daily maximum temperatures ranging from 18 to 25 degrees Celsius over this time. The winter months (when the camp is closed) are cooler (15 – 17C). September to January are the drier months. Jervis Bay is a great place for whale watching as Humpback whales migrate along the coast from June to November. By Road: Paperbark Camp is a 2 1/2 - 3 hour drive (approx.) from Sydney or 3 - 3 1/2 hours from Canberra. By Air: The nearest airport is Sydney and Paperbark Camp can arrange shared or private transfers. Please request costs if required. By Train: Nowra Bomaderry station is a 30 minute drive from Paperbark Camp and transfers can be arranged on request. 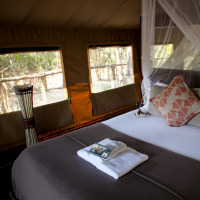 Nightly B&B rates start at AUD395 twin share in an Original Safari Tent (Shoulder Season, Sun – Thurs). Two night minimum stay applies when booking a Friday or Saturday night. See Specials for some great mid-week rates and other current offers. Please contact us for available specials. Rates based on two adults. Not valid during peak periods.